FROM A BESTSELLING AUTHOR! Dozens of messages since 2012 of the Blessed Virgin Mary at Medjugorje. 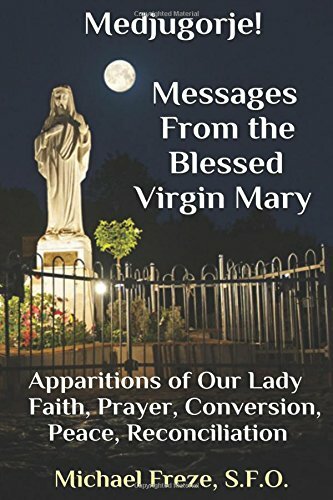 A background on Marian apparitions and early messages of Medjugorje. Our Lady speaks of faith, prayer, conversion. The author has been to Medjugorje twice. I have had 8 nationally-published print books to my credit: "Questions And Answers: The Gospel of Matthew," "Questions And Answers: The Gospel of Mark," "Questions And Answers: The Gospel of Luke," and "Questions And Answers: The Gospel of John" (all published with Baker Book House of Grand Rapids, MI). On the more scholarly side, I have written the following works: "They Bore The Wounds Of Christ: The Mystery Of The Sacred Stigmata," "The Making Of Saints," "Voices, Visions, & Apparitions," and "Patron Saints" (all published with Our Sunday Visitor of Huntington, IN). One of my recent eBooks now in print with Amazon Kindle ("The Complete Guide To Demonology & The Spirits of Darkness") received the Imprimatur after a prior review by the former Bishop Elden Curtiss of the Diocese of Helena, Montana. Released in December 2015, it is 450 pages long. I also have numerous other eBooks published with Amazon Kindle, audio books with Audible.com, and paperback books with Amazon. Education Background: A Bachelor of Arts degree in Secondary Education from the University of Montana, Missoula, Montana (1984). My major is English with minors in Religious Studies & History. Television Appearances as a guest interviewee for my works: "The History Channel," "The Phil Donahue Show," "The Leeza Show," and "EWTN: Mother Angelica Live! (3 Times as a guest).